This week over a 100 WSU students from every campus (including the Global Campus!) swarmed Olympia to participate in Coug Day at the Capitol as part of their annual day of legislative advocacy. 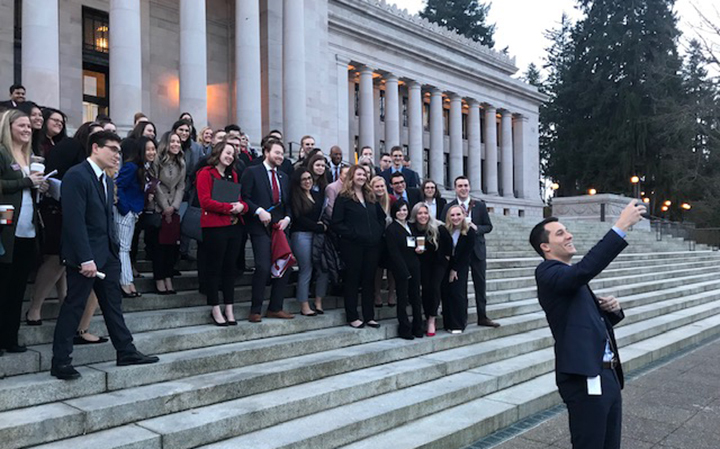 The event, which is organized by the Associated Students of Washington State University, allows students from all campuses an opportunity to meet with Washington state legislators to discuss higher education priorities. State Need Grant Expansion – Increase the Median Family Income threshold to 100% (it’s currently at 70%) and increase maximum allowance for students from families under the 70% threshold through HB 1123. Protect the Washington College Promise Coalition Scholarship Program – Reclassify the program (previously dubbed the ‘State Need Grant’) as an entitlement program under HB 1340/SB 5393 in order to protect funding from budget cuts. Expedite passing lane construction on State Route 26 – Lawmakers set aside funding for four new passing lanes along SR 26 last year, but the project isn’t set to begin until 2025. Students are pushing to start earlier to prevent any more students from tragically losing their lives along this stretch of highway. Mental Health Resources – Increase state public funding for full-time licensed mental-health counselors on each of the university’s campuses and support for SB 5053, which standardizes certification requirements for college campus mental health counselors. Veteran Tuition Waivers — Support HB 1178 which would expand the definition of eligible service members to include anyone with a general discharge under honorable conditions. The day was also highlighted by the raising of the WSU flag in the flag circle on the Capitol campus. The flag-raising was a reward for WSU students’ winning Gov. Inslee’s Student Voter Registration Challenge over student bodies from the state’s other public four-year institutions.